Earlier this year, America’s Best Communities (ABC) announced that Lake Havasu City won 2nd place in their “America’s Best Community” contest. The contest included 350 communities across the country. The goal of ABC’s contest was bringing residents together with local government officials to come up with ideas for improving their own communities. The Havasu Vision 20/20 plan for revitalizing Lake Havasu City garnered a $2 million prize. This helps further the goals Havasu Vision 20/20 set up. The official plan for revitalizing Lake Havasu City involves five separate areas (known as “pillars”). Several local businesses as well as government officials and members of the community work with each other within each pillar. Each group has their own plan for achieving the goals set up within each pillar. The number one priority for economic development involves job creation. For an economy to flourish, it must have an actively working community. One way to do so would be to make downtown more appealing to all ages. Members of Pillar 1’s group also plan on marketing the area to specific niche groups, recruiting a call center of 50 to 100 seats and creating a Smart Connected City program through improved technological infrastructure. Another major focus for revitalizing Lake Havasu City concerns education. Retaining teachers is key to success. Increasing student achievement also factors highly. How do we do this? By passing school funding measures to ensure proper tools will be in place. Also, Havasu Vision 20/20 proposes a type of mentorship program between schools and local businesses. This not only improves our local talent pool but strengthens it as well. From its inception, Lake Havasu depended on its tourism to fill City coffers. Improving amenities available lake side as well as better training for hospitality services translates into returning tourists and more money into our local economy. Part of this section of revitalizing Lake Havasu City concerns adding extra signage to make it easier to find local attractions and services. Understandably, water plays a huge part in the Lake Havasu lifestyle. Not only do we play in it, but its location in the middle of the desert makes it the community’s life blood. Years of drought-like conditions in our neighbors to the west put a huge strain on the local water supply. A healthy water system means good drinking water for humans as well as a healthy eco-system for lake inhabitants. The members of this pillar of Havasu Vision 20/20 work on treating, conserving and reclaiming water for the community. Finally, no city can succeed without community engagement. Using social media, Havasu Vision 20/20 encourages ideas from local residents. Follow them on Facebook to stay up to date on the latest news and celebrations involving Havasu Vision 20/20. Once a year, officials plan on hosting a town hall meeting to review progress on the program as well as invite ideas from constituents. 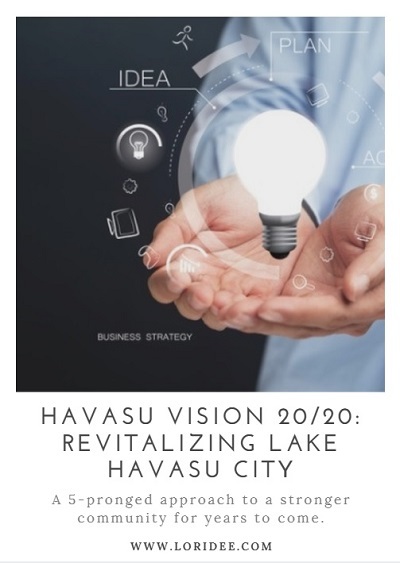 Revitalizing Lake Havasu City can be achieved through the Havasu Vision 20/20 plan. Be a part of progress. Find out what you can do to help make Havasu Vision 20/20 a success. Get more information about America’s Best Communities.